The advice in this post applies to your lives both inside and outside the office. It applies to all people, but especially to women, who tend to be guilty of using this phrase far more frequently than men do. How many times a day do you say this phrase? In which of these cases are you at fault? Unless you make a habit of purposefully running into people, it’s none of them! So why are we apologizing? “I’m sorry” is a very powerful phrase when used to signify remorse and to ask for forgiveness after arguments. By using it out of this context, you at best weaken the power of the phrase and at worst prepare everybody to find you at fault. We say “I’m sorry” because we want to avoid people criticizing us for a bad idea or for thinking ill of us. And it works. Saying “I’m sorry” is the equivalent of saying “Don’t hurt me” and few people are soulless enough to ignore that plea. But then what reason do they have to like or admire your idea? You’ve already warned them in advance not to be disappointed. Your credibility as the confident and smart person that you actually are is lost. We – especially women – must change this perception. There has been much literature about the income and achievement gap between men and women – but we cannot claim our equal rights in the workplace until we stop selling ourselves short. Here a couple of steps to start eliminating this phrase from your vocabulary. Pick just one phrase. It will be tempting to try to stop them all at once, but you want to maximize your chance at success. 3) For the first couple days, don’t actively try and change your behavior. Start by making notes of how often you say your phrase in these situations and whether there are any triggers in common. Do you say it most often in meetings with your colleagues or only when your boss is present? Figuring out your triggers will make changing your behavior much easier. 4) Now do whatever works for you to consciously stop saying the phrase. For some, telling someone else about your goal holds you accountable. Others need to put a post-it note on their computer screen. Others pay a dollar every time they slip up. Pick the method that works best for you. And be patient, changing any ingrained habit takes about a month, so don’t beat yourself up if you slip up along the way. It’s hard to comprehend at first how small changes in your language can make such a difference in how others perceive you, but I can attest to it from personal experience. Showing others only your best and most confident self builds your reputation in their minds, and the rewards just compound over time. So put only your best self forward! And send me your stories if you’ve applied this advice successfully in your life. Especially if something amazing has come from it. I’ve been on sporadic snowboarding trips over the past 3 years. I’ve managed to get to a point of relative comfort on blues and willingness to go on blacks with the understanding that I’ll probably falling leaf all the way down. Given that I had lot of learning left to go on snowboarding, going skiing for the first time seemed like an odd decision. 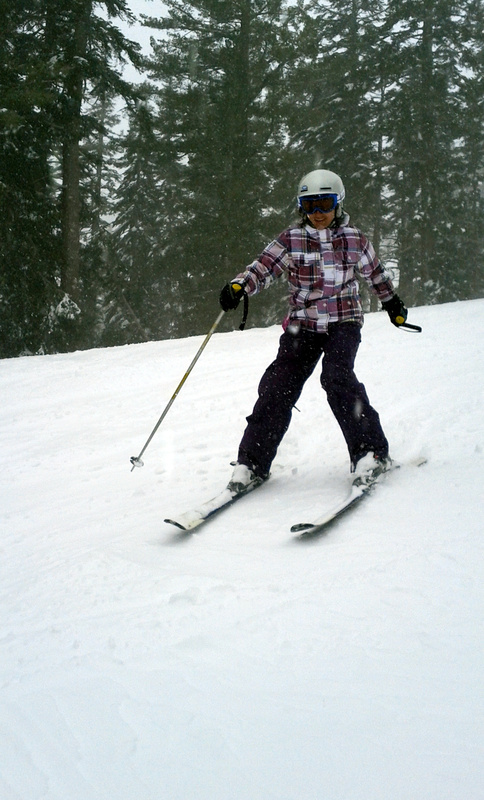 But thanks to over 12 feet of new powder to break falls and a very patient boyfriend, I decided to give it a shot. If you’re brand new to both, your choices are pretty even. You should go with whatever sport more of your friends like as that means more travel buddies and free tips. There’s one major exception that changes the equation: if you’re like me and have snowboarded for awhile, skiing will seem SO easy. 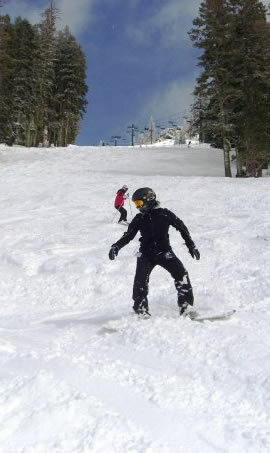 Last weekend at Kirkwood, I tried skiing for the first time and went down a black with parallel skis my first afternoon. All of the practice I’d had balancing on alternate edges of a board made skis seem like the most stable, predictable platforms in the world. And if you imagine that your feet are still on a board and must stay a fixed distance apart, you’ll keep your skis parallel in no time. I’ll need to take a few lessons to shake out some bad skiing habits, and afterwards… well, who says you need to choose just one? I won’t quite say that I can’t cook — when presented with a microwave dinner or brownie mix with instructions printed on the back, I have done an admirable job. But a combination of Google cafes and living in a neighborhood with the highest concentration of Zagat-rated restaurants in San Francisco has made me regard the kitchen with fear and bewilderment. Therefore it made complete sense for me to volunteer to host a dinner party. What follows is a step-by-step template for how to throw a dinner party for 20+ people, vegetarians accounted for, where your guests happily do most of the work for you and eagerly ask you afterwards for a recipe that doesn’t quite exist. I can’t think of a more efficient way to produce delicious food in bulk. 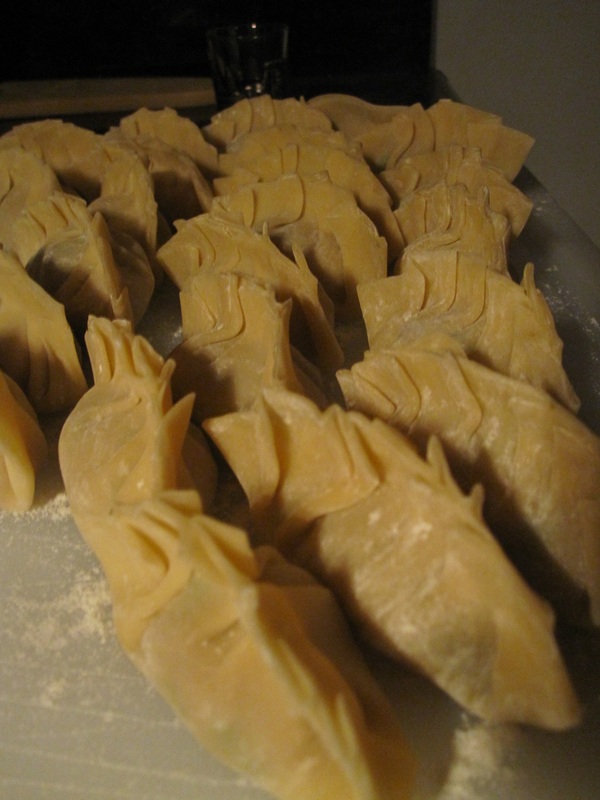 And since the guests themselves make the dumplings, they taste that much more delicious to them. 2. Wash the Napa (you only want the leaves and tender inner stems); cut to small pieces; put it in a bowl, add some salt, stir thoroughly. Put aside for awhile till some liquid can be see in the bottom of the bowl. Using your hands or a cheesecloth, squeeze liquid out of chopped napa. If you like, wash the squeezed napa again and re-squeeze as before. 3. Wash Carrot, Celery, Green Pepper, Fried Tofu (this one needs some of the liquid squeezed out after washing also), Ginger, Green Onion and Water Chestnuts and cut them into small pieces. 6. 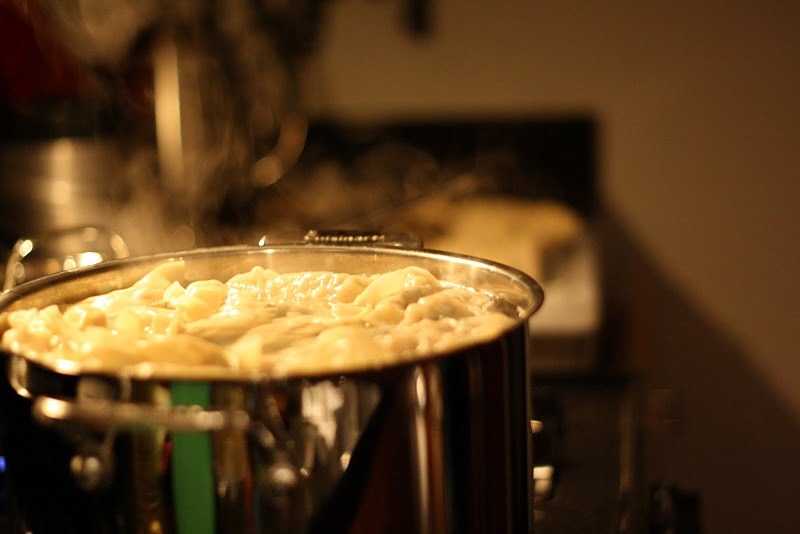 Boil water and then put dumpling into and continue cooking. Add cold water three times during cooking whenever the water boils. 3. Wash the Chives; cut to small pieces and squeeze some liquid out similar to Napa above. Save the liquid from squeeze into a bow. Then mix the Chive with a little oil. 4. Put meat into a bowl, add egg (you may only want the whites) If meat is too lean, you need to add some of the chive liquid from #3 also. Stir mixture in one direction until it become a little sticky. Add #1-2, salt, soy sauce, sesame oil and mix in the same direction. Note: if the soy sauce be added gradually will be better. You might notice as I did the distinct lack of numbers in the recipes above. This was by design as my mother always knew how much of each ingredient to put in. There are also a few ingredients in each recipe written in grey. These were items that weren’t in the original list and I ran out to a store in panic to get them when I saw them later in the recipe. Here’s to avoiding that the next time. Vegetarian mix: if you’re happy with the mix of colors, then it’s ready. I ended up not even including the carrot, celery or fried tofu. I kept feeding ingredients into a food processor and tossing it into a mixing bowl until the final result looked pretty enough to eat. The food processor is your best friend in this process, except for the items followed with an asterisk. These items either don’t get chopped evenly or get liquefied in a processor, so prepare them by hand. Pork and chive mix: You never have enough chives. Whatever you prepare initially, double the amount. For that matter, you really can’t have enough water chestnuts, either. Have fun with this one — compared to the veggie dumpling mix, this one is easy. TL;DR: Dumplings at a dinner party are delicious and impossible to screw up. I am at home with the flu and will be available by e-mail after noon PST. Please do not call my phone as I currently sound like Vito Corleone with laryngitis. Not only did writing this make me feel slightly better during a time when I couldn’t remember feeling more miserable – I also got 3 replies from co-workers within 15 minutes about how much they loved my away message. Highly-targeted e-mail marketing could not have asked for a better response rate. All of this confirms what I feared when I visited the doctor this morning – they don’t actually know if it’s the flu or something else entirely… just that my mouth feels like it’s swollen twice its regular size. So the best course of action was obviously to throw every drug they could think of at it while the lab techs do their work to diagnose. Where’s Dr. House when you need him? As someone who never gets sick beyond the occasional sniffles (squashed within 24 hours with obscene amounts of vitamin C), this situation wasn’t likely to repeat itself. Why not make the most of it? Especially since Vicodin = codeine + acetaminophen, and the last time I had codeine following wisdom teeth surgery left me passed out for 12 hours. For most of us, taking a vacation is a double-edged sword. On the one hand, you really need time off to recharge after a grueling year. On the other hand, you dread your e-mail inbox when you return – and by the time you’re finished cleaning out your inbox on your first day back, you need another vacation. I once spent 4 hours cleaning my inbox after a 2-week vacation. This time, after my 2-week vacation I spent precisely zero minutes cleaning my inbox. The reason was simple: I auto-archived everything and didn’t read anything when I got back. If a nervous sweat broke out on your forehead at the thought, keep reading. I had planned a vacation from December 24 through January 9. How to ensure that while I was in Costa Rica sipping water from a fresh coconut, the only things going through my head were electrolytes? 1) No matter how good my intentions were, I would check e-mail at some point. 2) If I read anything that I desired to respond to but couldn’t, I’d stress out and vacation feeling was ruined. Logically, the only possible solution that also ensured that I wouldn’t have a nervous breakdown from dealing with e-mail pileup when I returned was to make sure that I never saw it. But what of the consequences? At Google, your inbox is your umbilical cord to the world. In fact, it’s quite rare to ever hear the phone ring in my office. The first week without e-mail would be fine as things were always quiet in the last week of the year. But thefirst week of the new year would be a problem, as everyone clamored for your attention to finish things that didn’t get done in 2010. What’s the worst that could happen? 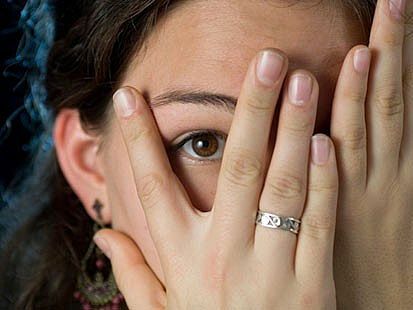 I tried to scare myself as much as possible: I’d miss a huge launch, I’d delay a huge launch, or I’d not respond in time to a VERY IMPORTANT E-MAIL (VIE). All of which would result in me getting fired. And then I had to hold myself to it. In Gmail, set a filter where anything “To:*” is archived. This diverts any incoming message away from your inbox, whether addressed to you or a mailing list. And honestly, after the third time checking e-mail and seeing no messages, I stopped checking altogether. So what did end up happening? Several frantics e-mail about launch happening the day I got back. Later got pushed back two days, so I had no problem supporting it. One blog post that I ended up launching one hour later than it was supposed to. The pros so massively outweighed the cons that I wondered why I’d ever had doubts. But if ever in doubt, put your worst fears into writing and you’ll see that they’re all manageable. Then kick up your heels and relax. You deserve it.